I am firm believer that orbs are spirits. With that I was taking pictures of a waterfall that at the time was just a trickle compared to what it looked like in the winter. I was quite intrigued with the solid stone wall which the waterfall fell over. I also noticed a square platform about two by two feet out on the edge of a big boulder extending out over the creek about twenty feet up. When I got home and looked at the pictures I took I found every one of them was full of orbs of all different sizes. One in particular was extremely large and sort of hiding behind a tree. I began to feel very uneasy about the place and couldn't get the stone wall and the platform out of my head. I wondered what kind of connection those and the orbs had. It wasn't mist. I saw the creek was at a trickle, and even then I was far away taking pictures. 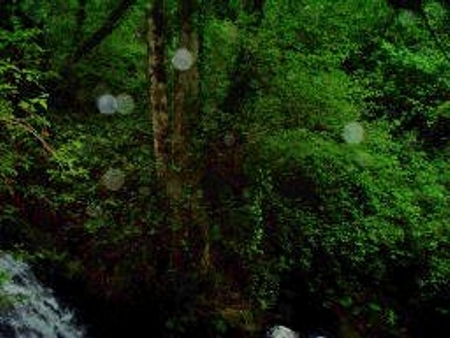 I went back and just talked as if to someone thinking that the orbs heard me. I apologized for disturbing them and thought that was the end of it. It wasn't. From that day to present I am experiencing harassment. Tables have been hit from underneath so hard they lift up off the floor. The computer comes on in the middle of the night. I am constantly woken up by my arms being lifted up in the air and then released to fall back down. The sound of shattering glass has awakened me only to find nothing broke. In my sleep a man's voice yelled my name into my ear that almost sent me to the ceiling.